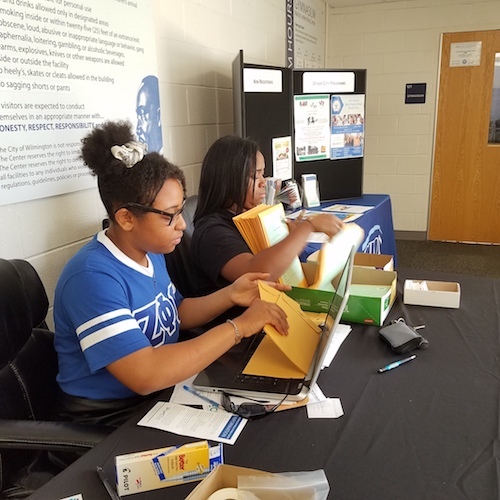 Team members from North Carolina State University at welcome tables during the sample collections compiled participant information. 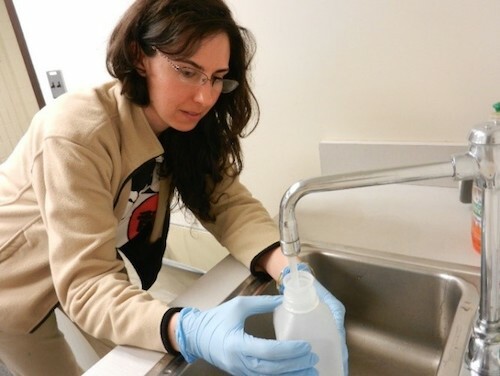 Water treatment specialists are facing a new challenge from emerging contaminants. Perfluoralkyl and polyfluoralkyl substances (PFAS) are a group of chemicals that include perfluorooctanoic acid (PFOA), perfluorooctanesulfonate (PFOS) and GenX. PFOA and PFOS are long-chain polymers, made up of eight different carbon atoms, while GenX is a short-chain chemical developed to replace long-chain PFAS. With thousands of variations of both long- and short-chain PFAS, the majority of research has primarily been focused on PFOA and PFOS. Now, years after long-chain PFAS have been phased out of production, towns across the nation are facing drinking water contamination along with a question: What exactly are the health implications of ingesting these chemicals? The U.S. EPA’s lifetime health advisory for PFOA and PFOS is 70 ppt, and there is no federal standard set yet for GenX, though the state of North Carolina has set a provisional health goal of 140 ppt. Moreover, recent toxicology research released by the Agency for Toxic Substances and Disease Registry suggests exposure could be harmful at much lower levels. The study reported that the current federal PFAS advisory level is seven to 10 times higher than when health effects were first noticed in animals. PFAS chemicals have been used in the production of firefighting foams, food packaging materials, nonstick cookware and household products, and in manufacturing facilities. Their reach is widespread, and while they have been phased out of production, their contamination lingers in surface water, groundwater and soil. If you go looking for PFAS contamination, then you will find it, and that is exactly what the state of Michigan is doing. The Michigan Department of Environmental Quality formed the PFAS Action Response Team to test water quality in 11,300 sites across the state where PFAS may have been used or disposed of, as reported by The Detroit News. The tests are expected to conclude by the end of 2018, and the team will test water supplies for 75% of Michigan’s population. As of press time, the investigation has revealed 34 confirmed PFAS sites across the state and led Michigan Gov. Rick Snyder to call for legal proceedings against 3M Co., the manufacturer behind Scotchgard fabric protector. In the city of Parchment, Mich., dubbed the “Paper City” for a former flourishing paper manufacturing business, PFAS have been found in the municipal water system in levels as high as 1,587 ppt—22 times the EPA’s lifetime consumption advisory. Parchment’s emerging contaminant problems are shared by Plainfield Township, the home of shoe manufacturer Wolverine World Wide, and Grayling, a military training base where firefighting foam frequently has been used, among others. The increasing number of contaminated drinking water systems discovered, coupled with the relative lack of toxicology data, has led to a call for action. From May 22 to 23, 2018, EPA hosted the PFAS National Leadership Summit in Washington, D.C., bringing together 200 people representing 38 states, including representatives from state, federal, industrial and water treatment industries. Topics discussed ranged from furthering health investigations to setting a maximum contaminant level (MCL). Eric Yeggy, technical affairs director for the Water Quality Assn. (WQA), represented the point-of-use (POU) and point-of-entry (POE) treatment industry at the summit. Of which, there are many. Researchers know the most about PFOA and PFOS, which were voluntarily phased out of the U.S. market in 2015. However, that leaves an estimated 3,000 to 4,000 different chemicals that fall in the PFAS class and published analytical methods for only 39 of them. This means that there is a huge group of chemicals potentially contaminating drinking water that scientists have an extremely limited knowledge of. Because the EPA lifetime health advisory of 70 ppt only applies to PFOA and PFOS, and because of the dispute surrounding the actual toxicology level of these chemicals, different states are adopting different standards. New Jersey has adopted an amendment to the Safe Drinking Water Act rule to establish an MCL for perfluorononanoic acid (PFNA) of 13 ppt, and has proposed an MCL for PFOS of 14 ppt. In Vermont, the drinking water health advisory level for five emerging contaminants, including PFOA and PFOS, is 20 ppt. While standards range across states, attendees of the PFAS National Leadership Summit agreed that the issue is not isolated. Until more information is available regarding the toxicity and persistence of these chemicals, water treatment solutions will be essential to restoring drinking water for impacted communities. According to Yeggy, WQA has been investigating reverse osmosis (RO), carbon and anion exchange as treatment solutions to PFAS contamination. In a 2008 WQA study, the association found RO systems to perform well against PFAS chemicals, while carbon-based technologies worked better on long-chain perfluorinated compounds (PFCs) than short-chain. 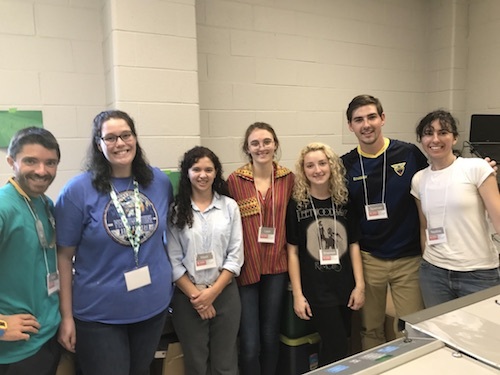 Team members from the GenX Exposure Study answered participants' questions at the first sample collection in November 2017, four months after the contamination was discovered. As information regarding toxicity longevity and water treatment methods for long-chain PFAS chemicals, such as PFOA and PFOS, is becoming more available, the next generation of those chemicals that were developed to replace them, such as GenX, are becoming a rising concern. In June 2017, GenX was discovered in the Cape Fear River, the main drinking water source for residents of Wilmington, N.C., at 700 ppt. Chemours, a spinoff of parent company DuPont, has been producing Teflon at their Fayetteville Works plant, located in Bladen County, N.C., adjacent to the Cape Fear River, since the 1980s. During that time, GenX may have been a byproduct of the Teflon production and later became an active ingredient in the early 2000s. When the people of Wilmington found out that they may have been consuming this relatively unknown contaminant for nearly 40 years, the question of long-term health effects became top of mind. The GenX Exposure Study, led by a team of researchers from North Carolina State University, is seeking to answer some of these emerging questions. Hoppin and her team have been collecting blood, urine and tap water samples from residents impacted by the contamination. The team is looking to pioneer research regarding the longevity and toxicity of GenX and other newer PFAS compounds about which little information is available. In addition, they have been testing tap water with different kinds of POU and POE solutions, which may provide information regarding viable drinking water treatment methods. The first round of test results have been released to participants and show promising results, while raising additional questions. The water samples collected in November 2017 showed GenX levels at approximately 50 ppt, Hoppin said, compared to 700 ppt in June 2017 and the state provisional health goal of 140 ppt. The fact that the level dropped dramatically once the plant stopped discharging industrial wastewater containing GenX into the Cape Fear River is promising, yet the lingering contamination points to non-point sources of contamination, such as soil contamination or residual groundwater or surface water contamination. Additionally, there were other contaminants that the scientists were unable to classify and quantify. Not having a chemical standard means that there is no toxicology data available and no chemical standard for toxicology testing. As much data the team has been able to gather on GenX, there remains a large class of chemicals that is largely unknown. The Wilmington community has remained engaged with the river’s water quality issues and with Hoppin’s study. As Chemours only provides bottled water to residents served by wells near the plant with drinking water testing above 140 ppt, other residents have turned to bottled water or filtration systems. Similar to other PFAS contaminants, RO has been found to be effective at removing a wide range of emerging contaminants. However, finding the right treatment solutions has been one issue facing Wilmington residents with drinking water contamination. For communities across the country struggling with drinking water systems tainted by emerging contaminants, from PFOA and PFOS to lesser known contaminants like GenX, finding verified water treatment solutions and the dealers who provide them will remain a need. During a sample . collection held at the Martin Luther King Jr. 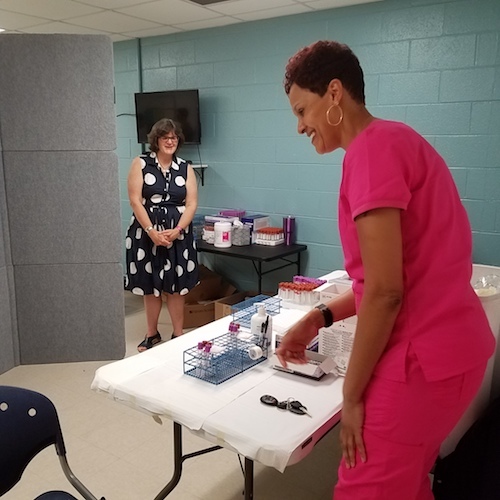 Cultural Center in Wilmington, N.C., Hoppin explains to the phlebotomist how the participants will flow through the collection process. A scientist working on the GenX Exposure Study demonstrates how to collect a water sample during a home visit.